Sometimes a reader will tell me I have a really weird mind. My older sister used to tell me that on a daily basis. I really don’t think there’s any real importance to endorsements, yet politicians believe in them. Chris Christie was really proud of receiving the endorsement from New Hampshire’s largest daily newspaper, The Union-Leader, yet he came in sixth place in the primary. That’s amazing. The last time Christie was sixth in line for something it was a salad bar. Sarah Palin endorsed Trump before Iowa, and despite speaking for stupid people everywhere, Ted Cruz won the caucus. Apparently the stupid brain dead incoherent demographic needs more research. Some crazy lady runs a very politically conservative, racist, and conspiracy-laden Facebook page and plans to announce an endorsement. Oh really? Will there be a press conference to display the full might of influence your Facebook page carries? I think some people mistake influence for flatulence. Now Bernie Sanders is having breakfast with Al Sharpton in Harlem and Hillary Clinton is receiving the endorsement from the Congressional Black Caucus. Some of the CBC members are stating that is not their personal endorsement. Madeleine Albright endorsed Clinton stating “there’s a special place in Hell for women who don’t help women.” Then every woman in New Hampshire voted for Sanders. Hopefully Hell has free college tuition. Here’s the thing: Nobody speaks for establishment Republicans, black voters, women voters, or even stupid people (though they need someone to hold their hand and explain things to them like Planned Parenthood isn’t selling baby body parts and Ted Cruz is NOT the face of God). Nobody cares about your endorsements. You do want endorsements to show that someone can tolerate the idea of you in the Oval Office. Newspaper endorsements don’t hold sway anymore but they should still endorse because it’s bold and they should have an opinion on their pages that are marked “opinion.” If anything, a newspaper endorsement can be very informative and let you know just what kind of psychopaths you’re dealing with. I will not endorse anyone and I wouldn’t expect anyone to care if I did. Usually I have to assure people I’m not with a certain candidate. I will not work or campaign for a candidate. Just when someone thinks they like me because I drew something nice about Hillary (for example) they’re very disappointed the next day when I lampoon her and make her bootylicious. Don’t trust me to be in your corner. I am left wing as anyone and probably even more so, but I’m also an editorial cartoonist, not an activist, who believes everyone is fair game. And quite frankly, I don’t want to join your little party. 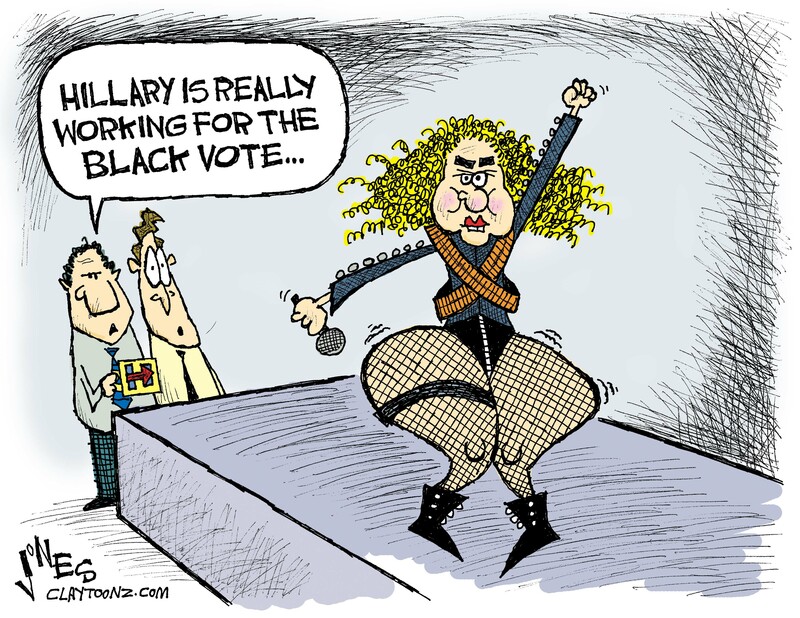 My cartoon on Beyonce and the ridiculous fake outrage by conservatives over her “anti-cop” protest was very good to me. It has received over 4,000 shares on Facebook and 25,000 views right here on this little website. Despite that, it’s not why I kinda drew the image again. It also didn’t deter me. I really don’t try to hit gold at the same spot. I just really, really, really, liked this idea and this image of Hillary Clinton. I’m also looking forward to the gag reactions of you, my readers. Sorry about that. Hope you weren’t having breakfast. But quite frankly, you should expect this sort of stuff of me by now. So it’s your fault.